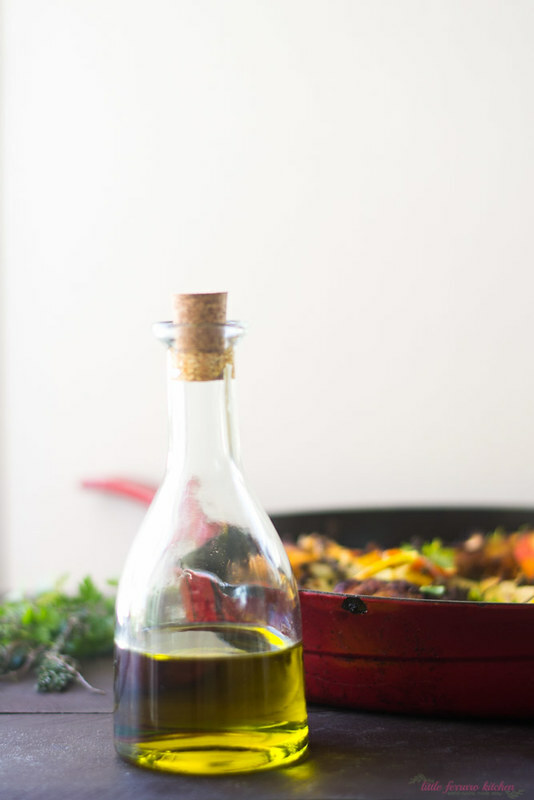 There is something so luxurious when cooking with Olive Oils from Spain. Ever since traveling to Spain last year (you know I can’t stop talking about that trip…please take me back! ), we have been using nothing other than Olive Oils. We shipped a few bottles back, and a year and few months later, are still rejoicing in the abundance and using it in every dish possible. 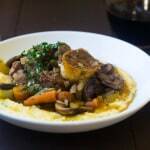 You can say that certain flavors or lifestyles influence the way I cook or want to cook. 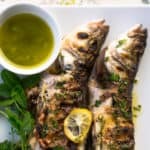 I focus on world cuisine flavors, introducing myself to new flavors and ways of eating, but alas, the Mediterranean “diet” is the true focus of how Joe and I enjoy our meals. 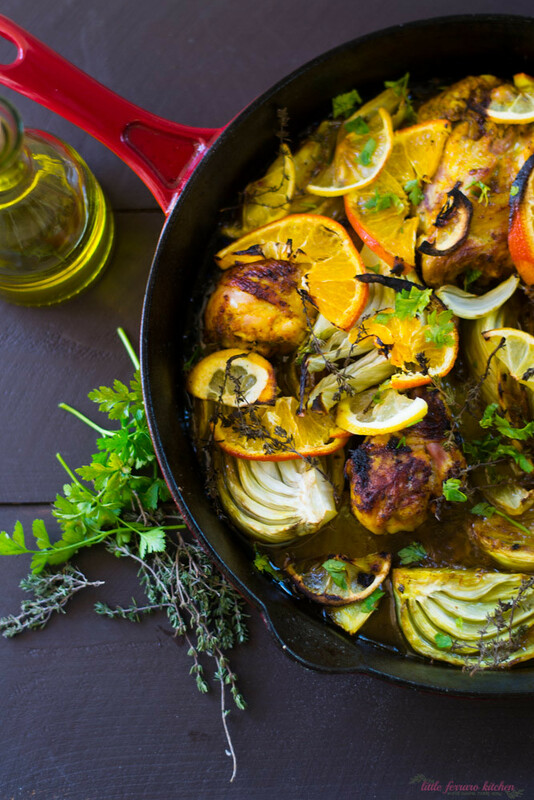 We crave bright flavors of citrus and herbs and often eat lighter proteins such as fish or chicken and always use Olive Oils from Spain in some part of the cooking process. 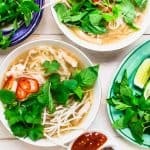 The Mediterranean Diet has been known to be one of the best “diets” to live by and has so many benefits, not only with it’s gorgeous flavors and ingredients, but health benefits as well. Such as lowering heart disease, increasing antioxidants and improving brain fuction (hello Omega’s!) and can easily be introduced into every day cooking. 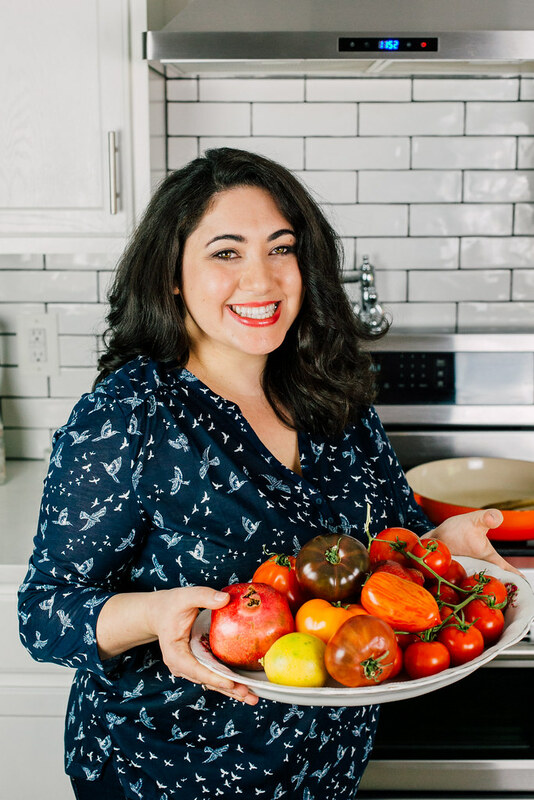 For instance, swapping butter for Olive Oil, focusing on seasonal and fresh produce, including exotic and colorful spices for depth and enjoying good healthy fats, such as salmon and Olive Oil can all make a huge difference in the way we eat. This recipe has been in my head for years but have been nervous about trying fennel for the first time. I’ve heard gorgeous stories of recipes using raw and cooked fennel, how it caramelizes when cooked and stays bright and crisp when left raw. But I couldn’t shake the horrid thoughts of forcing down black licorice as a kid and now 20 years later, haven’t tasted licorice since. I have crazy thoughts, don’t I? 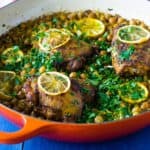 This gorgeous Olive Oil braised chicken exemplifies everything I love about the Mediterranean Diet. 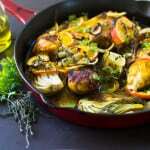 I start by marinating free range chicken in bright flavors of lemon zest, mustard and herbs and then braise it in a good amount of fruity Olive Oils from Spain. As the chicken browns, fennel and citrus slices are layered and an extra helping of fresh thyme from my garden. I can’t even express how beautiful this olive oil braised chicken is. The full flavor of Olive Oils from Spain paired with a bit of the chickens fat created a luxurious liquid that kept the protein incredibly moist and full of intense flavors. 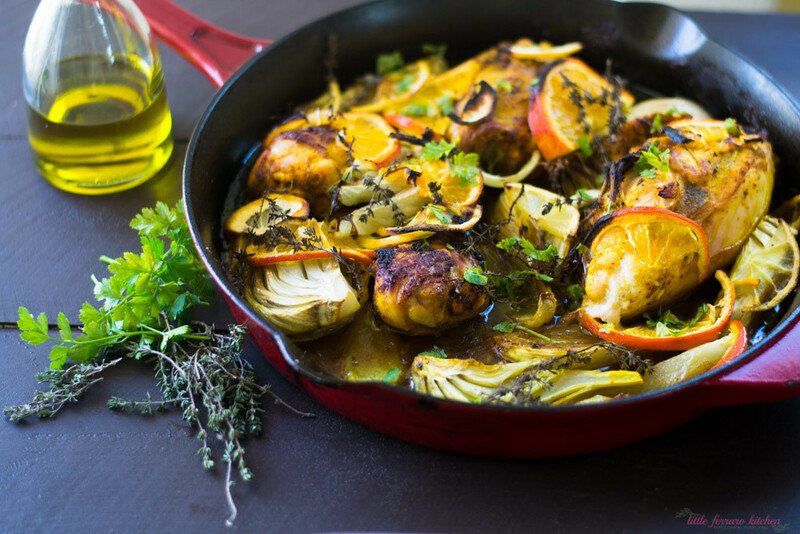 This is truly a gorgeous golden feast and is superb with softened fennel and caramelized lemon slices. The thinner you cut the citrus, the easier the skin will soften and you can’t help but beg to chew on the sweet zest. 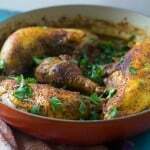 Serve this Olive Oil braised chicken with your favorite rice dish and a side of thick yogurt. 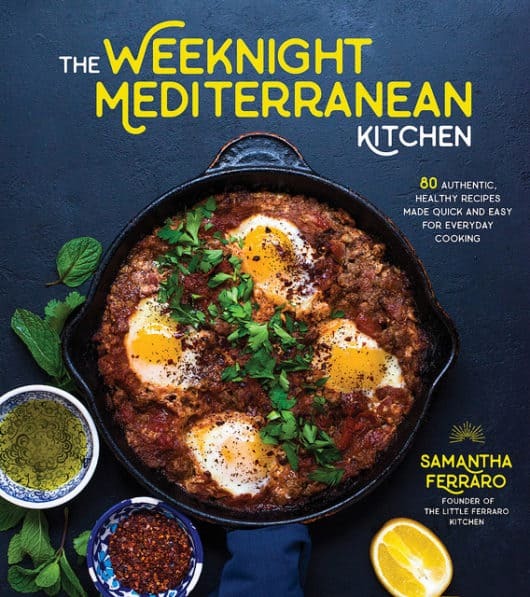 To learn more about the Taste Our Lifestyle Campaign and more about the Mediterranean Diet, including history, facts and recipes, please visit their website here. Also, the Taste our Lifestyle Campaign recently traveled the world with the Good life Embassy, sharing their passion for the Mediterranean Diet and Olive Oils of Spain all over the world! First, pat dry chicken pieces with a paper towel and add to a large bowl. Then add mustard, garlic, turmeric, orange and lemon zest and juice and thyme leaves and salt and pepper. Massage marinade all over the chicken and place in refrigerator for at least 20 minutes. Next, heat a large cast iron skillet over medium heat and add Olive Oils from Spain. Carefully add chicken to the hot cast iron and sear on each side so the outside is a deep yellow brown color, about 3 minutes on each side. 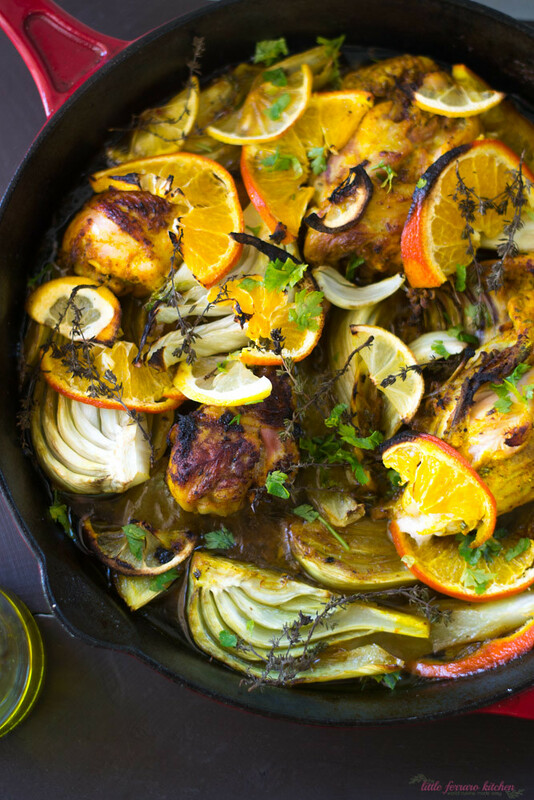 Once seared, add the sliced fennel, orange and lemon slices and more thyme sprigs. Season with salt and pepper if necessary and add chicken stock. 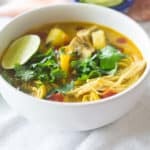 Bring to a boil and then reduce to a gentle simmer and then carefully place skillet in the oven and cook for about 25 minutes, or until chicken is fully cooked inside. 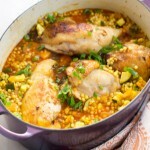 As chicken cooks, use a ladle to spoon braising liquid over the chicken. Once chicken is done, the sauce should have thickened and fennel and citrus tender. Allow to rest for 5 minute before cutting into chicken. Serve with Greek yogurt on the side, if desired. This is a sponsored post, however all delicious opinions are my own. Thank you so much Mila…I agree..nothing better than a good roast chicken dish! oooh I love this! I have the same aversion to black licorice so I hear you on the fennel thing…but I do love cooking with it. Oh I am so in love with everything about this dish! Especially the whole oranges. 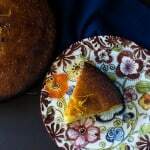 I love cooking and baking with whole citrus and I think it’s something that totally under used. Beautiful photos! I made your recipe last night. I only used 1/4 olive from Italy. Since it was a mild day in Upper Michigan, we cooked it on our grill which kept the mess outside. It was a beautiful looking dish and quite delicious! We will definitely make this recipe again. Thanks! I served it with a wild rice mix by Lundberg and a nice spinach and strawberry salad. I just bought some strawberries and the salad went well with this dish. Thanks! Hi Kaye! So glad you enjoyed it 🙂 I will have to try it on the grill next time! And I also love adding fruit to my salads…what a lovely meal you had!